Samuel Langhorne Clemens, better known by his pen name Mark Twain, was an American humorist, satirist, novelist, writer, and lecturer best known for the characters Tom Sawyer and Huckleberry Finn. At his peak, he was probably the most popular American celebrity of his time. In 1907, crowds at the Jamestown Exposition thronged just to get a glimpse of him. The Adventures of Tom Sawyer is set in the 1840's in the fictitious town of St. Petersburg, Missouri, where Tom lives with his deceased mother's sister, Aunt Polly, and his half-brother, Sid. After Tom plays hooky from school, he is made to whitewash Aunt Polly's fence as punishment, but persuades his friends to do it for him. Tom's real trouble begins when he and Huck Finn witness a murder committed by Injun Joe. They swear to never tell, and the wrong man, Muff Potter, is accused of the crime. Tom, Huck, and a friend run away to be pirates, but become aware that the whole town is searching for their bodies. Each of the boys make an appearance at their own funerals, where they are greeted with open arms. As Muff Potter's trial begins, Tom is overcome with guilt and testifies against Injun Joe, who quickly flees the courtroom. Later, on a class field trip to a cave, Tom and his love interest, Becky Thatcher, get lost. As they run out of food and candles searching for a way out, Tom and Becky come upon Injun Joe, who is using the cave as a hideout. Tom finds a way out just as the search party is giving up. The town rejoices and Judge Thatcher, Becky's father, has the cave sealed, unknowingly trapping Injun Joe inside where he starves to death. FCIT. "Mark Twain author page." Lit2Go ETC. Web. 19 April 2019. <https://etc.usf.edu/lit2go/authors/5/mark-twain/>. 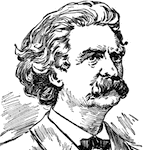 FCIT, "Mark Twain author page." Accessed April 19, 2019. https://etc.usf.edu/lit2go/authors/5/mark-twain/.